Shop Infinity Shoes, online at infinityshoes.com for a large selection of fashionable women’s boots, shoes and sandals. You'll find some of the best brands, such as Miz Mooz, Frye, Minnetonka, Dr. Martens, Old Gringo and many more. 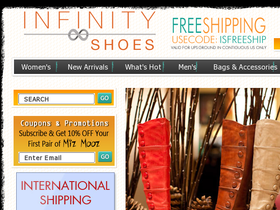 Infinity Shoes offers both domestic and international shipping. Visit 58coupons.com to save on your next purchase from Infinity Shoes with the latest coupons, promotions and discounts. For a limited time save up to 70% on select styles during Infinity Shoes summer sale. Follow this link to see the selection. Get free shipping on orders of $85 or more from Infinity Shoes with this coupon code! Click link. Save $12 on orders over $100 from Infinity Shoes when you use this code at checkout. Click link and start shopping. Use this coupon code on Infinity Shoes and you can save $10 off your purchase of $100+. Sign up with Infinity Shoes today and receive 10% off your first order. Click link to get started.